Full featured financial calculator for BlackBerry Storm. Supports many financial, math, and statistics functions. Features include: time value of money, cash flow analysis, amortization, depreciation, bonds calculations, odd period calculations, mean and standard deviation, linear regression, coefficient of determination, normal distribution, weighted average, calendar functions, and lots more. 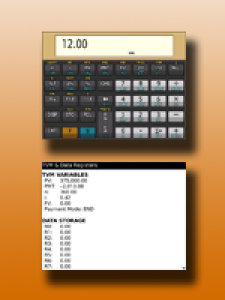 Supports RPN and algebraic data entry. Works with portrait and landscape orientations. Displays all financial and data storage registers in one convenient window.